GunLink had a chance to stop by the Springfield Armory spot on the shooting line at the 2012 NSSF SHOT show Media Day at the Range and shoot their latest offering. The XD-s is so new, in fact, that this range time is the first time it’s been in the hands of people who didn’t make it. The XD-s, the newest addition to Springfield Armory’s line of XD pistols, is a slimmer, lighter pistol that still packs the punch of a .45 ACP round. With an overall length of just over six inches and a height of four inches, the XD-s weighs in at only 29 ounces. The single stack 5+1 magazine capacity also allows it to be easily concealable with its width of just one inch (0.9” along the slide). With a weight of just 29 ounces and a 3.3 inch barrel, one might think that recoil would be an issue with a .45 ACP caliber weapon, but that’s not the case. During our test fire, the recoil didn’t seem to be much, if any, worse than other polymer framed pistols of the same caliber, even full sized models. The manageable recoil, along with the low profile snag-free fiber optic front and steel dovetail rear sights came together to ensure that each shot fired was put on target with a satisfying “ding” following each smooth pull of the trigger. The XD-s, which disassembles the same way as other XD models (with very minor differences regarding magazine insertion/removal when the disassembly lever is being manipulated), also shares other features with its XD brethren. The XD-s also has the Ultra Safety Assurance trigger system, grip safety, loaded chamber indicator, textured grip, Melonite finish and under-barrel, single-position Picatinny rail. Given the small stature of the XD-s, it felt a little small in my relatively large hands although, thankfully, the interchangeable backstraps and well positioned magazine release from the XD-M made it into the design along with its short trigger reset. If you want to add an XD-s to your collection, however, you will have to wait. 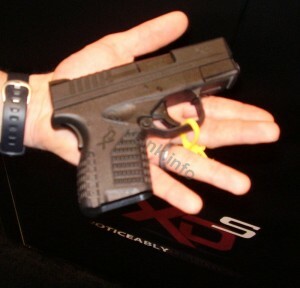 This slim striker-fired pistol won’t be hitting shelves until at least March of 2012 and Springfield Armory has not yet announced the price.